Very quickly, let's talk packaging. The typography and layout have had a bit of an upgrade. Instead of the bold red we now have a refreshing white and yellow scheme with a lot of breathing room which is great because they filled it with a bullet-ed list of dietary buzzwords. (Get out your bingo cards!) Seemingly, this product has all your bases covered. We've got the good ol' gluten and peanut free, which is honestly a great thing to point out, but then we also have the classically misleading "all natural flavors" along with "real fruit juice" and no artificial colors or preservatives. The old bag boasted real fruit juice, and being gluten free without any artificial colors...but now all the colors in this bag are different. The flavors are too! Apple, Orange, and Blueberry have been replaced with Cherry and Raspberry. (Strawberry is the only flavor that stayed.) 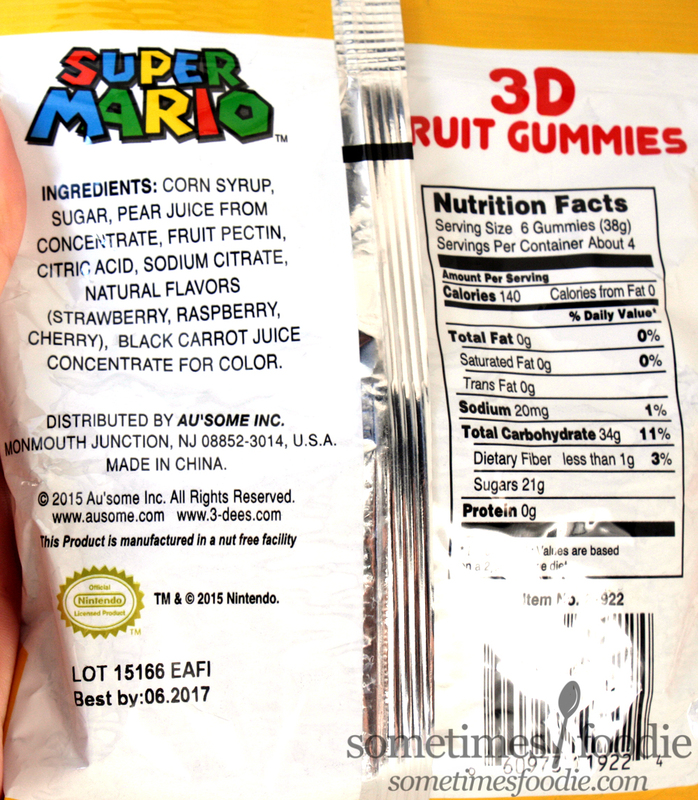 If the original was already without artificial colors and made with real fruit juice, why did they change the formula so much? That's when I noticed something, this new bag features a photo of the new creepy pink-fetus-colored gummies, not a clear window like the old bag. What are they hiding in there...? WHAT HAVE YOU DONE?! This is an unholy pile of fused-together sugar-baby demons with the faces of Nintendo's A-listers popping out of ambiguous transparent-flesh-piles. How did this even happen? Why would they change this product so much? 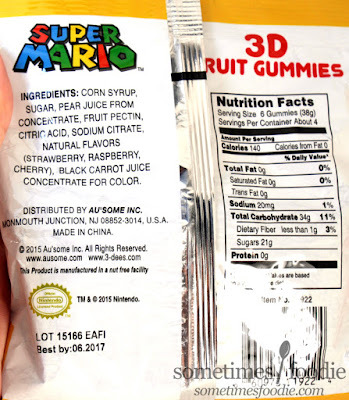 It looks pretty gross, especially since some gummy figures have somehow formed their own granulated sugar chrysalis reminiscent to the pods in Gremlins...but I'm going to see if these somehow taste better than they look. Somewhere in this mess are three different flavors, they aren't really labeled well on the bag, so I think I managed to find each one. Strawberry (mid-translucent pink) - I think this was strawberry? It kind of tasted like generic fruity nothingness, but towards the end it kind of made me think of strawberries, at least more-so than the others, it was also very hard to visually tell the difference between these and what I believe to be the raspberry. Not terrible, but not really strawberry either. The sugar-crusted ones taste like sad fruit snacks found at the bottom of a back pack after a long week of school. 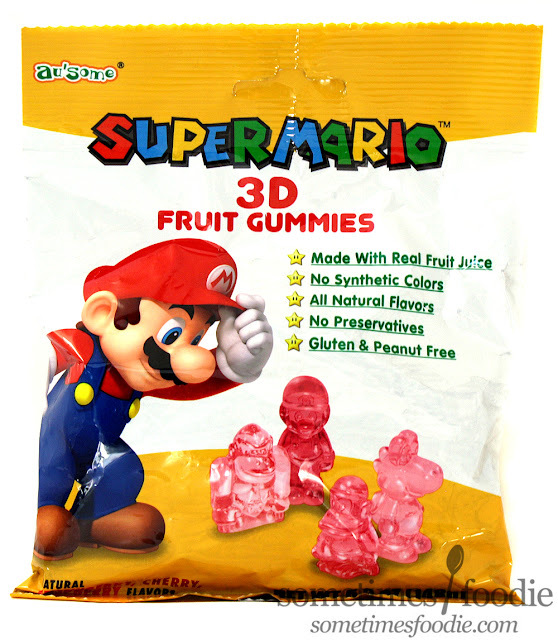 Clear are edible, but really generic. 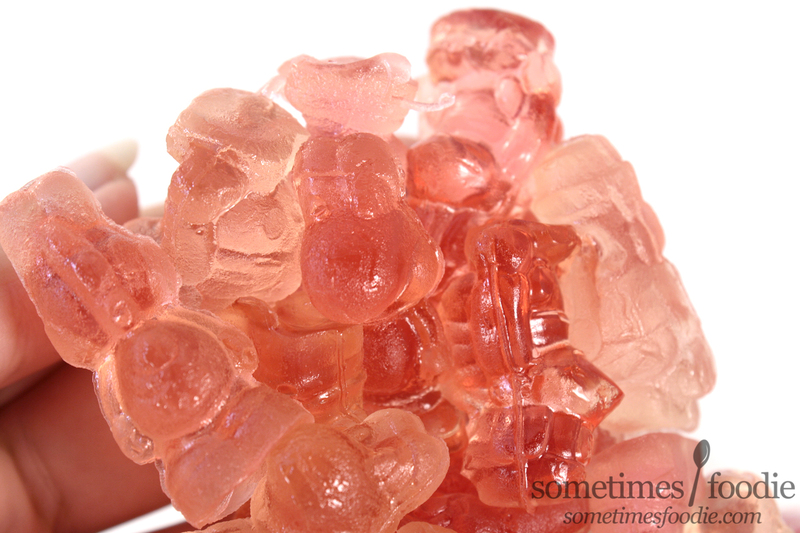 Raspberry (lightest translucent pink) - This flavor had the most clear ones of the three. They remind me of a super sweet white raspberry Juicy Juice, and they're not that bad. I don't think I saw any crystallized ones of this flavor, but it's very easily confused with the strawberry. Can you hear Yoshi begging for the sweet release of death? The clear ones were edible, but not great, and I found all three flavors to be too similar to really enjoy. This is a complete flop. I really liked the original gummies, and would love to see those come back. This newer version is just...awful. They obviously have some kind of instability on the shelves that needs to be addressed, and the colors are too similar to tell them apart visually when they form a nightmarish amorphous blob in the bag. Unless these things get reformulated, hopefully back to the original, I can't say I'd ever recommend them. Now, because I am insane obsessed curious, I went to the 3-Dees site and checked out their Nintendo line too see what they offer and....it looks nothing like EITHER product. They show off a blue gummy in the promos, and there was NEVER a blue in either bag. 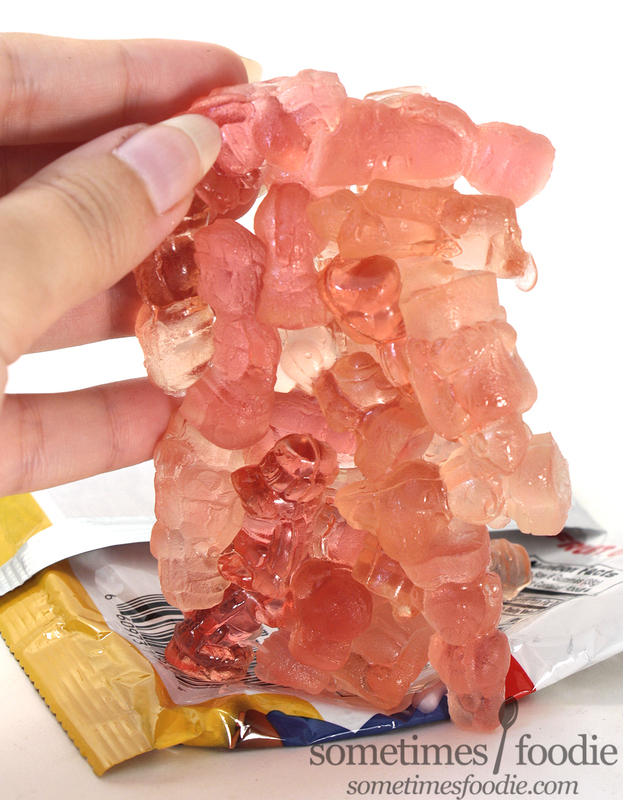 Also, upon further inspection, these new flesh-y looking gummies are colored using...black carrot juice? Okay, googling black carrots kind of made this worth the $1.00 purchase. They're pretty cool looking, but I still can't say I'd recommend buying this candy. This is one dollar store find to avoid.